The study, commissioned by AdWest Marketing and conducted by Totum Research Inc. is based on a sample of 750 phone interviews with people living in various sizes of communities under 50,000 population. It confirms that several factors, most of which are less prevalent in urban markets, bind rural households more tightly to traditional media, printed local newspapers in particular. With over 6 in 10 adults 18+ indicating they follow all types of news most of the time and topping at over 70% for provincial and local news, the appetite for information amongst rural households is strong and perhaps growing. 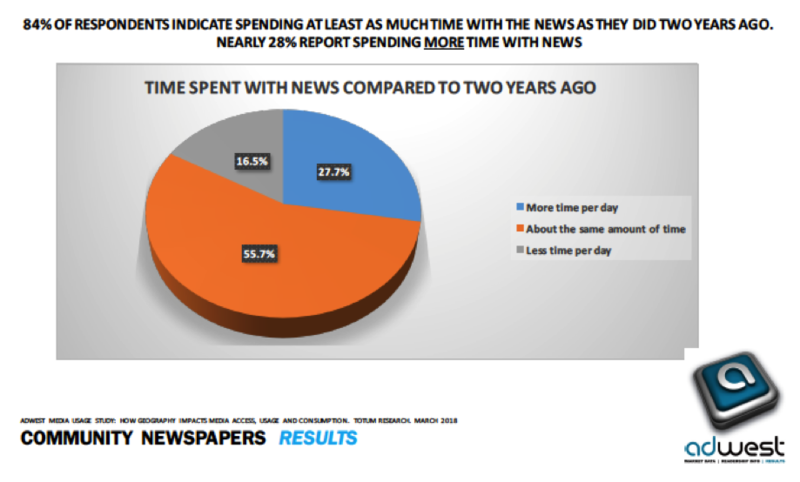 55% of respondents said they spend as much time with the news today as they did two years ago and a whopping 28% indicating they’re spending more time with the news today. Of topics having local relevance to them, the printed version of the community newspaper was the preferred source for information across topics ranging from news about local people to local businesses, sales and events. Online platforms, including the website of the local newspaper ranked behind all forms of traditional media in terms of respondents’ preferences for source to receive information. In the face of a narrative that claims receivership and readership of ALL newspapers is dwindling, the study shows that printed community newspapers on the prairies continue to defy the popular opinion. 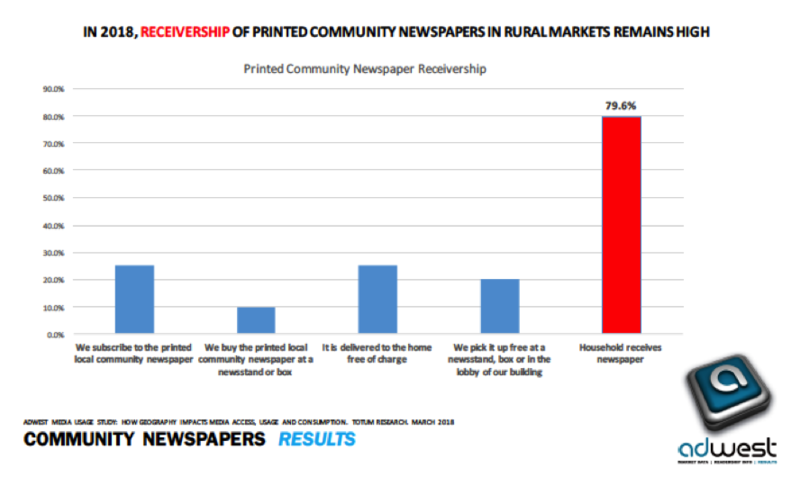 Receivership of printed local newspapers across communities of 50,000 population and less stands at 79.6% with 79.2% of respondents indicating they’ve read or at least looked into a printed community newspaper in the last week. By comparison, the last release from ComBase (Community Newspaper Database) in 2005/2006 reported Read Last Issue numbers of 67% and 83% for Manitoba and Saskatchewan respectively. Interestingly, readership of printed community newspapers was actually higher in households (80.7%) with an internet connection than it was in households without internet service (74.2%) suggesting that an internet connection doesn’t automatically result in a canceled newspaper subscription. The differences between media consumption habits in urban and rural areas start to become clearer when the results of the latest NewsMedia Canada Newspapers 24/7 are considered. Whereas urban residents are more likely to be consuming newspapers online (as high as 58% for mobile devices), the results of the How Geography Impacts study shows that only 12% of respondents in rural Saskatchewan and Manitoba visited the website of their local newspaper in the last week. 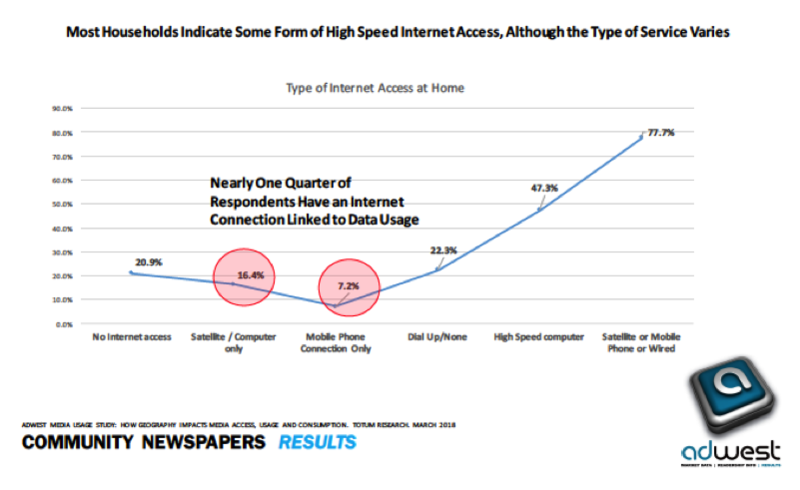 While over three quarters of respondents indicated that they did have an internet connection at home, less than half were served with the same type of service used by most urban households, wired high speed. Nearly one quarter (23.6%) subscribe to internet service bound by data limitations (satellite, mobile phone) and 22.3% reported either no internet connection or dial up service. The resulting impact on how internet gets used in the measured markets is significant. The majority of respondents said their internet connection either affected or prevented online activities ranging from shopping (26% affected) through watching streaming video (33%) and engagement with social media (26%). When it comes to doing online research, a staggering 41.3% of respondents said their internet connection affects their ability to do it. Perhaps as a by-product of preserving the precious commodity that is bandwidth, 22% of respondents indicated they have an AdBlocker installed to block ads on devices used to access the internet. 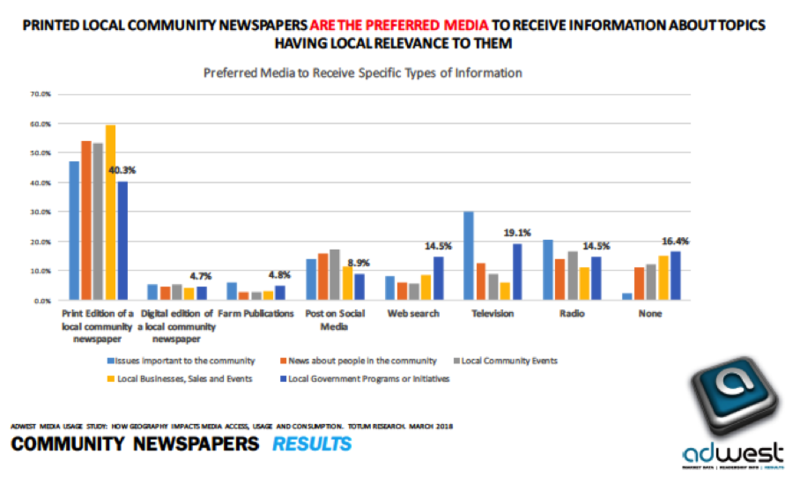 Respondents trust in traditional media is unwavering with printed community newspapers leading the way with nearly 80% of respondents indicating a significant level of trust in its content and advertising. Conversely, people’s level of trust in content and advertising of online platforms ranks the lowest of the measured media with only 29% (websites) and 25% (social media) of respondents saying they trust at least somewhat the content and advertising appearing. 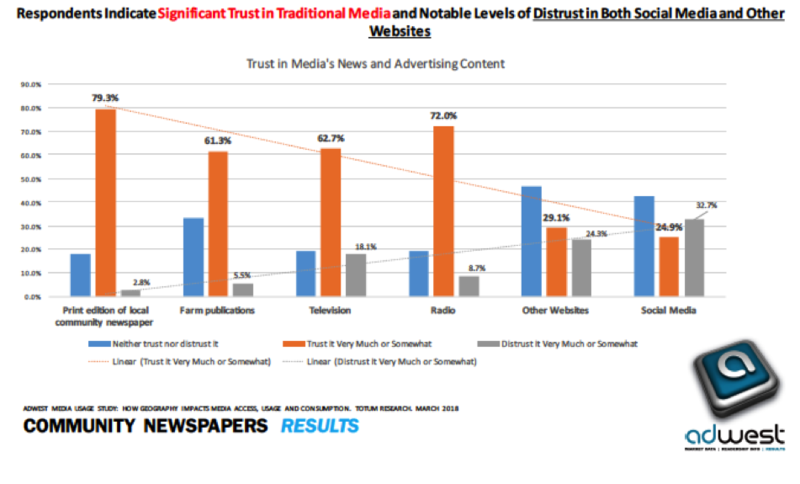 Conversely, significant levels of distrust are more likely to occur with the online platforms (33% and 24% for social media and websites respectively) than traditional media, where printed newspapers once again lead the way with significant levels of distrust at only 2%. Respondents trust in the various vehicles is likely to be underpinning their opinions on the value of advertising contained in each medium. Whereas 54% of respondents indicated they found ads in printed community newspapers to be useful, less than 10% (8.4) said the same about ads on websites or social media. Possibly more telling were the numbers tied to the respondents’ negative feelings about advertising. While only 2.2% of the sample indicated that they were Annoyed by ads in printed community newspapers, just under 40% (39.3) stated that they were Annoyed by ads appearing on websites and/or social media. The study also provides some awareness on media in which ads are most likely to inspire action. Across all 7 business sectors measured (automotive, agriculture, food/grocery, government, retail, financial and telecommunications) the influence of the printed local community newspaper was once again, abundantly clear. 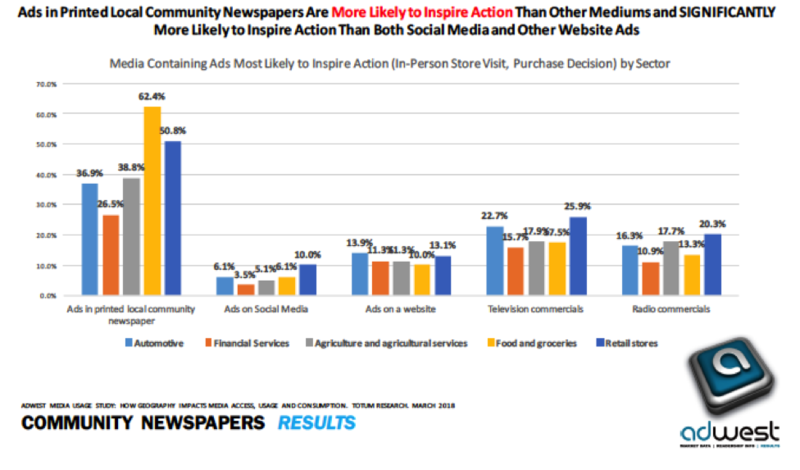 In each sector respondents indicated print ads were twice as likely to inspire a store visit, website visit or purchase than television ads and up to 10x more likely to inspire action than social media ads. How Geography Impacts Media Access, Usage and Engagement – A study to determine what impact the size of community a person lives in has on the accessibility, usage and engagement of specific media platforms. The survey uses a probability sample of adults 18 years of age or older. The qualifying person in the household with the most recent birthday will be selected for the interview. For the Farmers segment, the questionnaire will screen for most recent birthday among those in the household involved in farming decisions. Maximum margin of error for 750 completions is ±3.6%. Totum Research is Canada's leading research firm specializing in the media. Since 1985, Totum has produced reliable and actionable data for a wide variety of clients ranging from national daily newspapers to small market radio stations, from million+ circulation consumer magazines to e-commerce websites and from advertising agencies to multinational corporations. Totum has conducted marketing and communications research for beverage, information technology (IT), women's products, financial institutions, automotive and government departments.